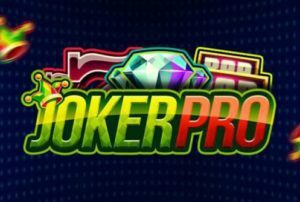 At Boku Slots we love a game with a simple old school Vegas feel, so we were overjoyed when we came across Joker Pro. This elegant yet traditional slot game comes from the team at NetEnt and its modern take on a classic slot has people spinning with delight. You will be pleased to know it is just as good if not better than its predecessor Twin Spin, with an RTP of 96.8% and a bet amount starting at just 1p. What’s great about Joker Pro is the way the game is played. It is simple yet effective in the way it is designed, making it easy to play and enjoy. Although Joker Pro is limited on features it has 5 reels and 10 paylines, and the scatter symbols drop with a nice regularity. Bet Amounts – Betting begins at just 1p per pay line on Joker Pro and increases to £1. As there are ten pay lines your bet amounts begin at 10p and rise to £10 per spin. This makes for some pretty affordable play time. If you want to increase your bet, you do this by adjusting the coin amount and level at which you play from level 1 up to level 10. Joker Re-Spins – Land the joker hat scatter symbol on reels 2, 3 or 4 and you will trigger the joker re-spins feature. Once activated reels 1 and 5 become wild reels and remain fixed, until the feature is over. The scatter symbols that triggered the feature will turn into wild cards and they too remain on the reel until the feature is over. If another wild lands during the Joker re-spins, that too will hold in place until the bonus ends. Hot Spot Wins – If you land three scatter symbols across the centre line of reels 2, 3 and 4, you will trigger the hot spot wins. This means you will win 1000x your stake amount instantly. Other Symbols – Your other symbols are the traditional diamond, red sevens, bars, bell, horseshoe and four-leaf clover. If you were to land 5 of the diamonds this would return you 200x your stake amount. Whereas 5 of the four-leaf clovers would return you 40x your stake amount. That gives you an idea of the kind of wins you can expect whilst playing Joker Pro. With its low amount of pay lines that are fixed, you’d think this wouldn’t make for great gaming. If anything it makes it more intriguing, playing to land those scatter symbols in the hope of triggering the Hot Spot win is actually quite exciting. The scatter symbols land fairly often too, meaning your chances of winning something back is increased. 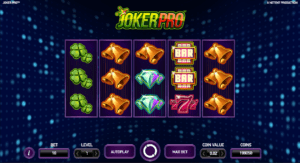 You can also play Joker Pro across all devices, whether that’s desktop, tablet or mobile.